Netherlands based Bang Bang Systems reduced its footprint with the purchase of a HARMAN Soundcraft Ui16 digital mixing system, allowing owner José da Silva to streamline his operations with no reduction in sound quality. He reinforces the sound mid-sized shows and runs two different festival halls that cater to Caribbean bands. A typical festival for da Silva attracts between 500 to 800 people. 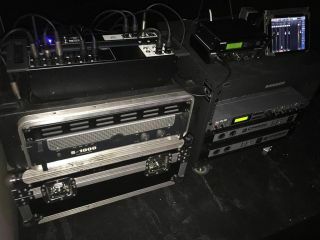 Having used many mixing consoles before from various brands, he was determined to find a compact solution that would greatly reduce his mobile footprint at events without sacrificing sound quality and mixing features. The Soundcraft Ui16 digital mixer is a remote-controlled mixing system in a compact, road-rugged stagebox format, with built-in Wi-Fi, 31-band graphic EQ, noise gate and compressor on all outputs. It also features three dedicated Lexicon FX busses for Reverb, Delay and Chorus effects as well as eight XLR combo mic/line inputs, four XLR mic inputs, two Hi-Z/instrument inputs and a stereo RCA line input. The system’s goal is to Maintain the audio quality of more expensive mixing consoles while delivering faster results per show at a lower price point. Featuring AFS by DBX, guitar effects by DigiTech, and vocal effects by Lexicon, the Ui16 is the combination of HARMAN’s audio technologies in a digital Soundcraft package.